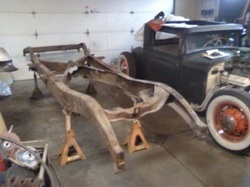 Bare Auburn 8 cylinder frame upon arrival January 2012. 127" wheelbase. 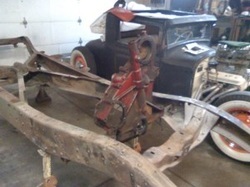 I have since sold the 1929 Essex coupe to help pay for the Auburn build. It was a fun Hot Rod. 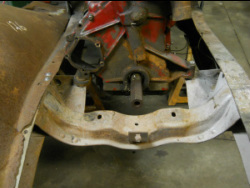 The V12 front engine cover lines up with existing holes in the 8 cylinder frame. 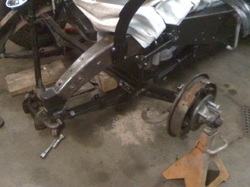 Front axle with new bushings installed.1952 GMC truck brakes fitted to the stock '31 Auburn axle. Replacing the "Steeldraulic". 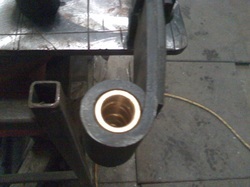 Brass bushings from Eaton Detroit Spring installed. 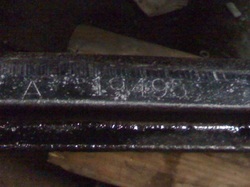 Front axle ID stamped "A 19495" This axle is from a 1931 Auburn, the numbers stamped are supposed to be a date code of sorts with "A" meaning "January", but the rest make no sense to me. 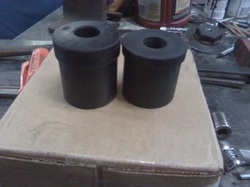 I had to remove some material from the shoulder of these bushings. The shoulder was 1/4" too long. I faced these off in my Lathe. 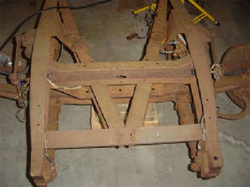 Photo of an Auburn V 12 frame. Note the additional "V" bracing and forward crossbar. This makes the splash pans different on the 8 and 12 cars. 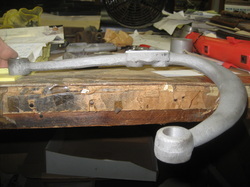 NOS steering arm from the ACD company. 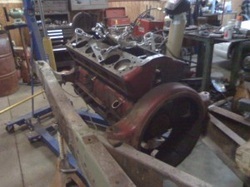 The one from my axle had been removed, perhaps to keep another Auburn on the road at some time? This is the "New" one. 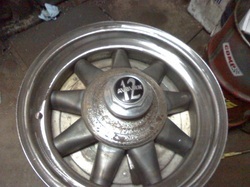 Mockup of the wheels I purchased from "Rally America". 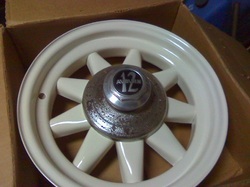 The bolt cover and axle cap are stock Auburn pieces I have found along the way.